Monarch Watch » Blog Archive » Monarchs in Space – Classrooms Wanted! Monarchs in Space – Classrooms Wanted! WANTED: Schools and individuals (located in the U.S., east of the Rocky Mountains) to follow the development of monarchs on the International Space Station. We need to have you commit to this program by 5PM central on Friday afternoon (November 6th) – sorry for the short notice! 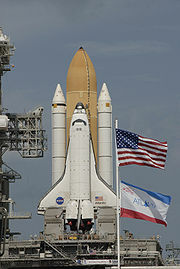 The next Space Shuttle launch is scheduled for November 16th (Mission STS-129). Atlantis will carry three 4th instar monarch caterpillars to the International Space Station (ISS) in a small rearing chamber. This chamber will be placed in an incubator aboard the ISS where the developing monarchs will be monitored. Still and video cameras will continually capture images, which will be made available online. We have prepared a text that outlines normal development of monarchs from the fourth instar until emergence as adults. This detailed text is written for adults and contains an extensive glossary. It is intended to provide the information teachers need to answer student questions and as a guide to the five major challenges monarchs face in the nearly weightless environment of the International Space Station. If you would like your school or classroom to participate, please contact us at monarch@ku.edu before 5PM central this Friday (November 6th). If you participate in this program you will be able to follow the shuttle mission to the space station and the development of the monarchs in space for at least two weeks. Background materials, additional instructions, and relevant links will be available via our website – stay tuned to our blog for details. So awesome, we have worked with the public schools in our area and really got a nice response from kids and parents in starting waystations, and tagging to help out the Monarchs. Would love to be involved with this project! Still interested… Hope you have room left for me and my 1st grade neighbors. My firsst/second grade class is part of Plan B and they were very excited to watch the Space Shuttle take off this afternoon. They know that the caterpillars on board are the brothers and sisters of the ones eating away in our classroom.